All transactions are safe and secure with a reliable history in online purchasing behind each of our associates. Buy the Hurley and the Smoke Monster t-shirt to own Lost clothing and merchandise. 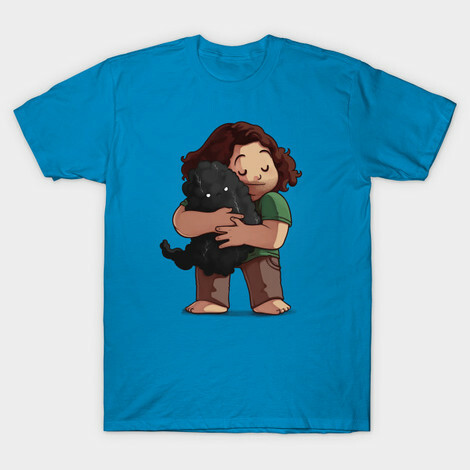 This design features Hurley and the mysterious black smoke, which he is cuddling with like a teddy bear. Wear it as you play the lotto with the bad numbers "4 8 15 16 23 42". No one knows the curse of the bad numbers better than Hurley, who won the Mega Lotto with them only to see his world begin to fall apart around him. On the island, Hurley recognizes the numbers again on the hatch to the Dharma Initiative's Swan Station. The numbers also must be entered into the station's computer in order to maintain its stability. This impressive Lost Hurley t-shirt shows that everyone likes Hurley, even the Smoke Monster. In addition to the Hurley and the Smoke Monster tee above, browse the Lost Clothing Gallery for more apparel like men's and women's clothes, kids shirts or hoodies.